LightHouse MAX 2m3 is the premium tent for the grower who wants no compromises. It offers a durable and heavy duty white powder coated 25mm steel frame that incorporates metal corners and the thickest and strongest poles on the market with multiple choices of ducting and cable glands all with double seals. 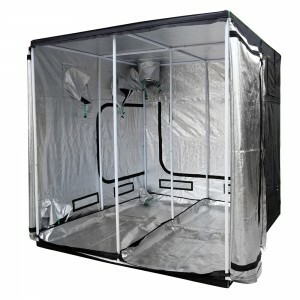 It is constructed from heavy duty Tri-Layer 600 Denier material with a new reflective liner called UltraLux, which offers up to 30% high reflectivity over traditional products and it has Tivax zips that are fitted to all doors and have a proven ability to offer a quality seal when closed. 4 options for extraction through the roof or the side. 1x base side inlet with a 315mm (12") ducting gland. 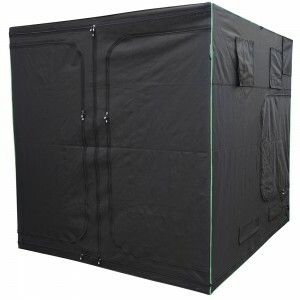 This tent has 6 x low level passive air vents with fine (anti-mite) mesh that includes light proof covers for when they are not in use and 8 filter straps. It is an ideal for a four lamp set up (either 4 x 400w HID or 3 x 600W HID) and an extraction fan around 1000-1200m3. For optimal climate consider an environmental controller.